Elliot (Josh Hutcherson) is a miniature horse who has always dreamed of flying with the reindeer, and when Blitzen (Martin Short) announces his retirement right before Christmas, leaving Santa (George Buza) scrambling to find a replacement to fill his spot on the sleigh team, he sees an opportunity to finally realize this dream. This is the basic plot of Elliot the Littlest Reindeer, a Canadian animated film from writer-director Jennifer Westcott. It serves as a largely mediocre holiday adventure that doesn’t have enough going for it to be remembered as a classic, but it will still pass the time well enough for kids come next Christmas. Elliot lives at the Witty Bitty Farm in North Dakota, a reindeer farm and petting zoo run by Walter (Rob Tinkler), who inherited the property and is struggling to keep it running, in one of the film’s subplots. Helped by his scrappy goat friend Hazel (Samantha Bee), Elliot sneaks away to the North Pole to compete in the reindeer games, going up against DJ (Christopher Jacot), the reindeer equivalent of a dumb jock, whose father Donner (John Cleese) is determined to help him win at all costs. The story is predictable, and offers a fairly generic “follow your dreams” message, but Elliot the Littlest Reindeer is also a film that, among other things, includes subplots involving a conspiracy to modernize the North Pole and replace the flying reindeer with a fleet of techno sleighs; an evil woman named Miss Ludzinka (Martin Short) who wants to buy the animals from the farm and turn them into jerky; and a doping scandal involving magic cookies baked by Mrs. Claus (Angela Fusco) that give the reindeer the power to fly. This all manages to be both more and less weird than it sounds. This isn’t a great movie, but it’s by no means a bad one either, despite its obvious flaws. The animation by the Toronto-based Awesometown Entertainment is somewhat technically limited, but is still fine for something done on a smaller budget, and the film does feature some more interesting design elements of the North Pole. It’s mostly forgettable stuff, but Elliot the Littlest Reindeer is still an alright film that is helped along by its celebrity voice cast, and will provide passable entertainment for its target audience. The DVD includes no bonus features, but comes with a digital copy of the film. 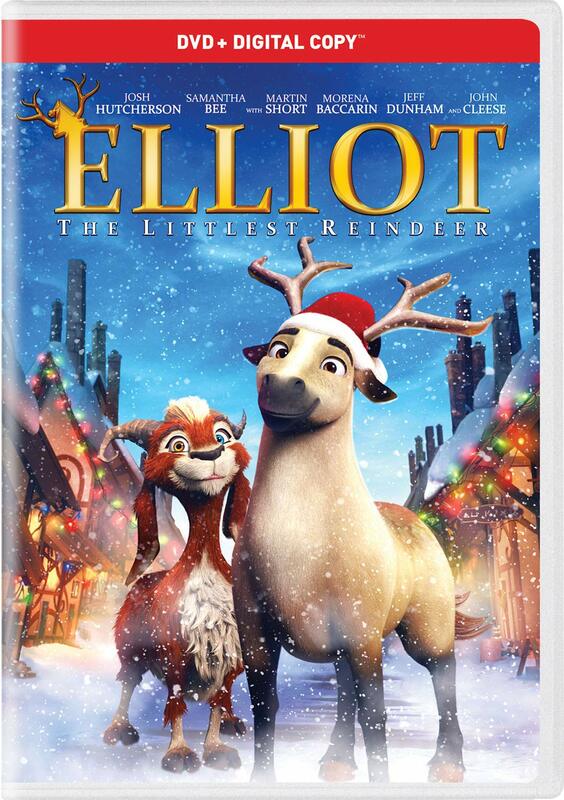 Elliot the Littlest Reindeer is an Elevation Pictures release. It’s 89 minutes and rated G.